Feiyu G4 Pro Review! – Best Gimbal for Android Smartphone? 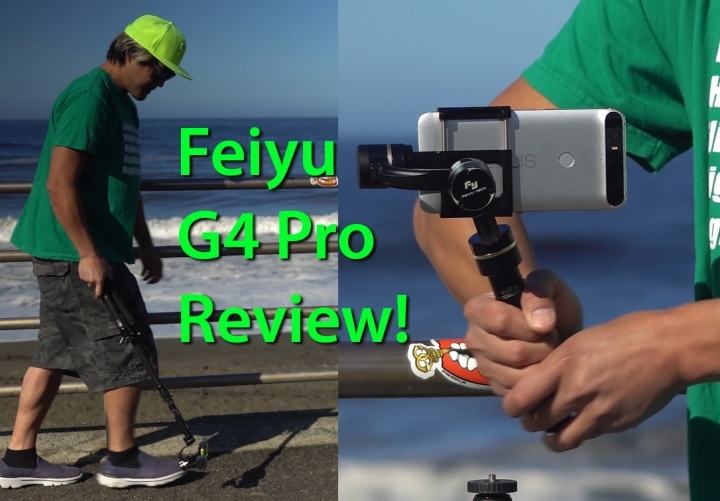 Many of you know I love gimbals and if you are looking for the best gimbal for your Android smartphone, you may want to check out the Feiyu G4 Pro. The Feiyu G4 Pro is a lightweight yet powerful gimbal that comes with all of the professional gimbal features you would want. I really love the fact that it has a standard tripod mount screw so I can screw it to any of my tripods. First off, it comes with a joystick that allows you to rotate horizontally in never ending circles. Second, you can also rotate vertically to about 180 degrees in each direction using the joystick. Third, there’s a button that gives you various different modes. To power on the gimbal, simply press the button for a few seconds. In regular mode, your gimbal will follow whereever you point the gimbal. Press the button once and it will lock it into position so it will stay no matter how you move the gimbal. You can see now that the phone will stay in one position no matter where the gimbal is. Press the button three times, you will be able to get inverted mode. While my older Lanparte gimbal didn’t support inverted, the Feiyu G4 Pro is an awesome way to get close-to-the-ground shots. You will be able to easily get low shots in front of you and behind you. If you want, you can get even more creative and use it almost like a jib with a tripod attached. This gimbal is also one that can be used with smaller phones or even with larger phones like Galaxy Note 7 or even the Nexus 6P. While I’ve had a lot of trouble using my older Lanparte with the 6P as it will start stuttering at certain angles, the G4 Pro is nearly flawless. There is also the DJI Osmo Mobile, which I hear is excellent but doesn’t do well with bigger phones like 6P or Note 7 so if you need a gimbal for a phablet, the Feiyu G4 Pro may be the way to go. For balancing, the G4 Pro comes with extra weights to help you balance bigger smartphones, this is one of the main reasons why it works well with bigger phones. Battery seems to last forever. It uses standard IMR 18350 batteries and comes with 4 batteries. The gimbal only uses 2 batteries so you can easily swap out without having any downtime. Also, you can easily re-charge the batteries using any USB port. As a person who have used many gimbals before, I am definitely impressed with the Feiyu G4 Pro, especially the way it handled my Nexus 6P, which was the only phone that didn’t work well with my older Lanparte gimbal. If you are looking for the best smartphone gimbal, I don’t think you can do wrong with the Feiyu G4 Pro, it will do pretty much everything a professional gimbal can do. So definitely check it out. Next story $1500 Sennheiser HD800S Unboxing & Test w/ LG V20 DAC!